The story probably happened with turks when Baal Shem Tov was in Stambul. Term Ishmoeylim is often used to denote muslims in Yidishe sforim, and not only particularly arabs. 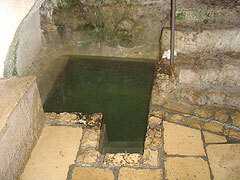 You are right about the term "Yishmaelim" in seforim in general. However, Rabbi Nachman seems to believe that the Turks are the true Yishmaelim, if I understand him right. "The Rebbe [R. Nachman] said: 'Yesterday the Turk [Yiddish: "Torg"] came to me in a dream and complained about the various powers waging war against him. I had great pity for him -- and he really deserves pity, because he still goes by his original name Yishmael, while in the case of the other nations, their identity is unknown, because they have all become mixed together [see Yadayim 4:4, that Sancheriv of Assyria mixed up all the nations]. However, the Turks still go by their original name [Yishmael]. I gave him some advice, and it appears he also knew about this strategy, but he pretended not to know..."
He goes on to say that the Yishmaelim have much power, due to the incident of Hagar and her son Yishmael, of whom the Torah states, "And I will make him, too, a great nation... " as we read on Rosh Hashanah. Admittedly, this is a very mysterious sichah. But the point about the Turks being the Yishmaelim seems clear. Unless the Rebbe is not using the term "Turk" in such a limited national sense -- which would bring us back to Square One! The obvious (from a neutral position)is that a man as spiritually advanced as Baal Shem Tov was asking; what is the seperation that man creates by calling anothe man unclean, is it rational, what are the ramifications on our souls, what does it make us?